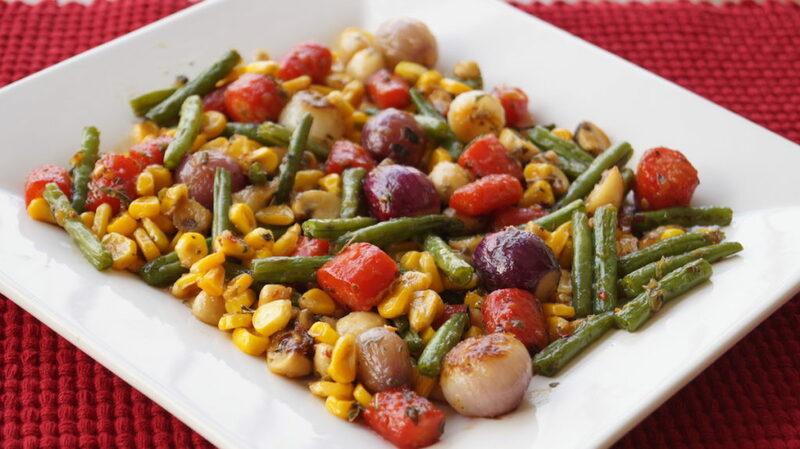 What do you do when you have boring vegetables in your fridge? You throw them all together and pair them with a nice chicken bake. And how do you make boring vegetables taste nice? You add honey. If you manage not to screw them up completely (it would actually take a huge effort – to screw up) you’ll get a nice crunchy, sweet, salty, buttery, herby, spicy side dish with would be appreciated by all, other than your 10-year old brat who generally does not like any vegetables, unless they are smothered in cheese sauce. I’ve adapted this recipe from a women’s magazine of the 60’s my grandmother kept a cutting of and handed over to me when she found out I had developed a mild interest in cooking. That recipe had sugar and some other things but I’ve kept it simple and slightly healthier with my use of honey. Even my mom, in whose presence I manage to muck up even fail-safe recipes, said the veggies were delicious, so maybe there’s something to it. I’ll leave it to you to decide though. Peel the carrots and cut them in 1 centimetre circles. 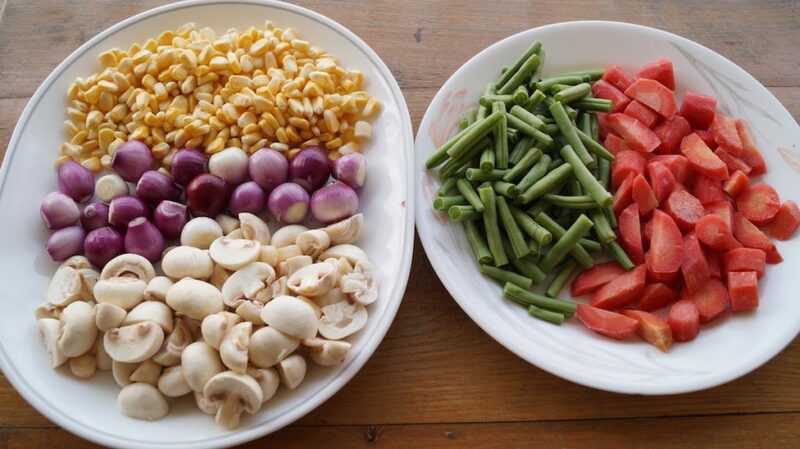 Cut the beans in 1.5 inch sticks and cut the mushrooms in half. If the mushrooms are very large, you can cut them into quarters. Boil water in a saucepan and blanch (boil) the carrots in the boiling water for two minutes. 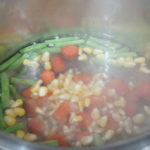 Blanch the beans and corn for one minute each and remove from the water making sure all the water is drained. 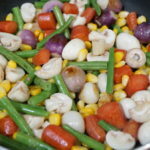 Do not over-boil the vegetables else they will become overcooked and lose their crunch. Heat 1 tablespoon of olive oil in a non-stick pan and toss the shallots in and saute on medium heat till slightly softened and translucent. Should take about 3 minutes. Toss in the carrots and saute for another 2 minutes. Throw in the beans and corn and saute everything for another minute. Then crank up the heat to medium-high and add the mushrooms and saute for 1 minute. They may release a bit of water, that’s ok.
Add the garlic paste, salt, oregano and chilly flakes and mix well till all the vegetables are coated evenly with the seasonings and the spices. Add the honey and saute for another 2 minutes. Add the butter and let it coat all the vegetables. Saute for another minute or two till you get a lovely glaze. Important notes: Do not blanch the vegetables for too long.You will kill the texture and any possible enjoyment you could get from the dish. Have all your ingredients prepped and at hand. 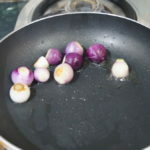 This is a quick stir fry and having to hunt for an ingredient in the middle of cooking will not end well for the dish.